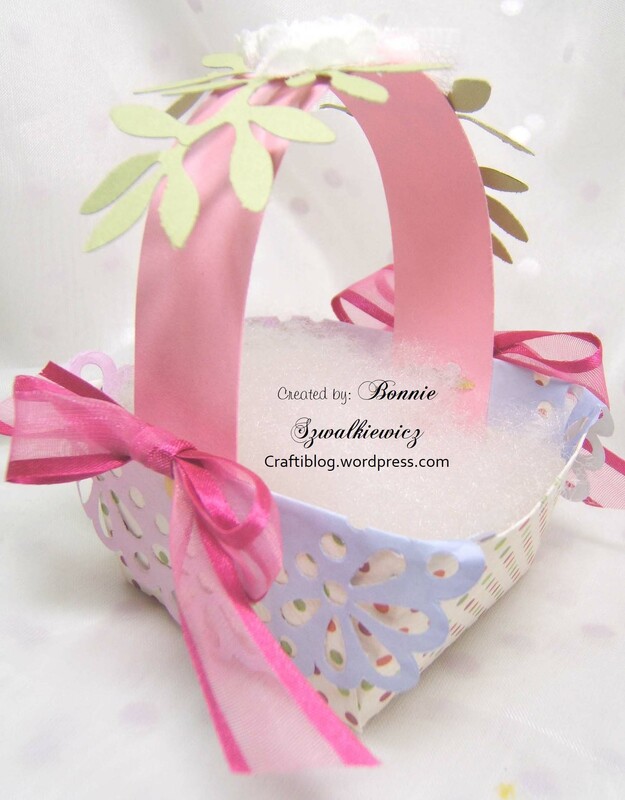 I decided that because Easter is this month I could have the ladies make a mini Easter basket as an extra project. I showed them how to use the punch board to make quick work of this little basket. 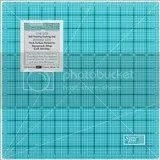 We started with a 6″ square of double sided DP. Here is a top view of the finished, decorated basket. And a side view. 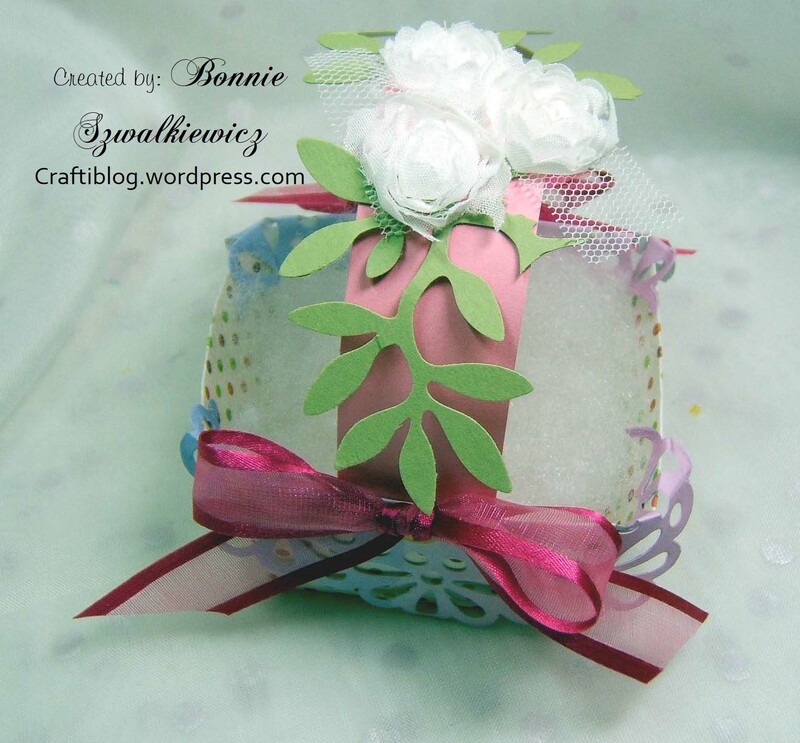 You can see that we added ribbon; colored doily’s; punched leaves and ribbon roses. 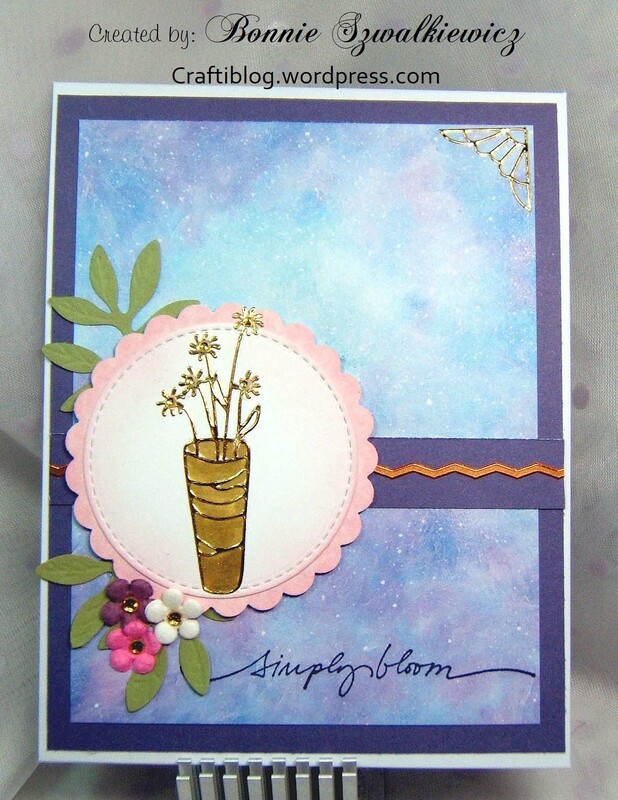 The next card was designed by Jane. 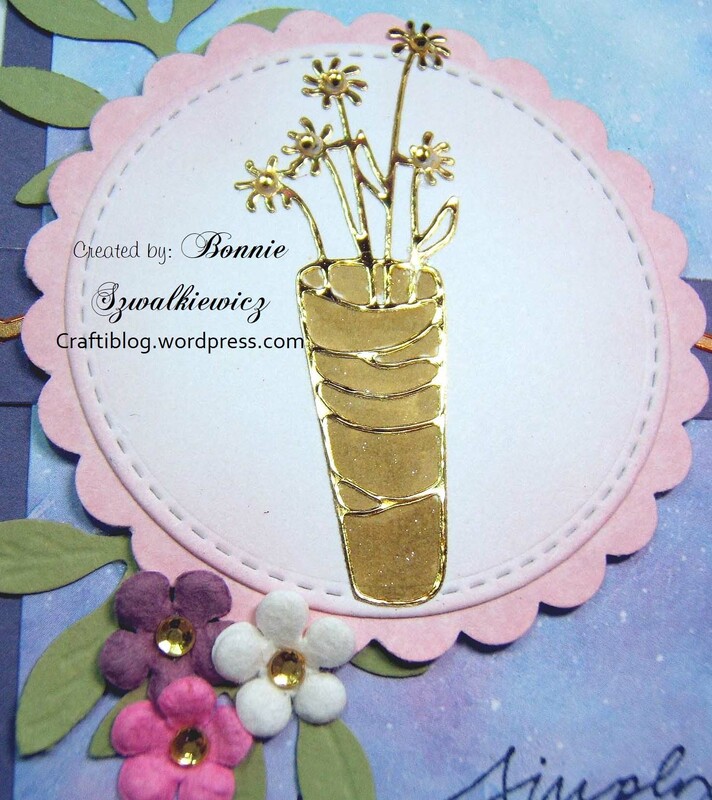 She said she surprised herself with this one and told me it looked just like a “Bonnie card.” I have to agree; it does look like something I would have designed! We filled the flower centers with bright yellow flower soft. The next card was also supplied by Maggi. As with yesterday’s design we were only supplied with the card base, a piece of DP and a gold foil sticker. 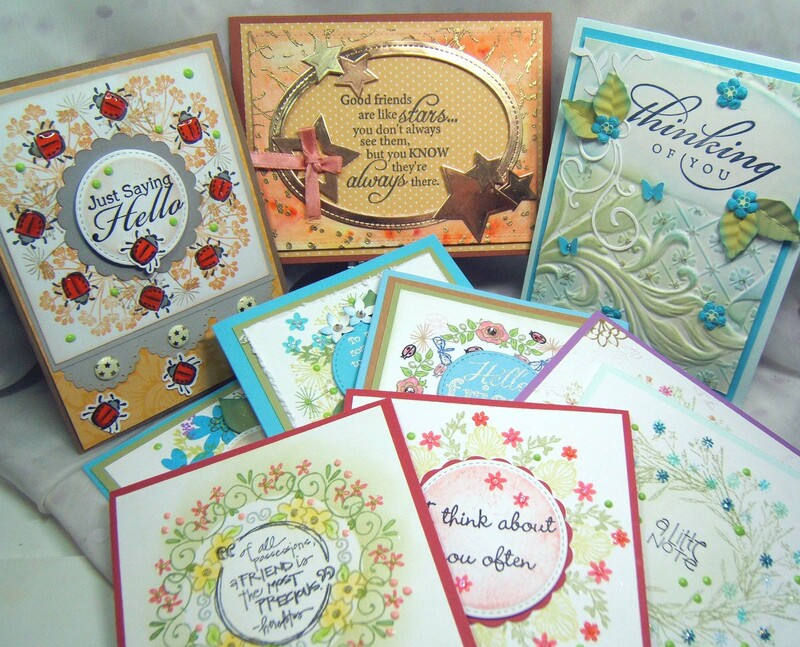 Thankfully One of the ladies had a set of sentiment stamps along and I had the basket full of DP scraps as assorted left over punches. Here you can see the center medallion. This is the foil sticker that was supplied. 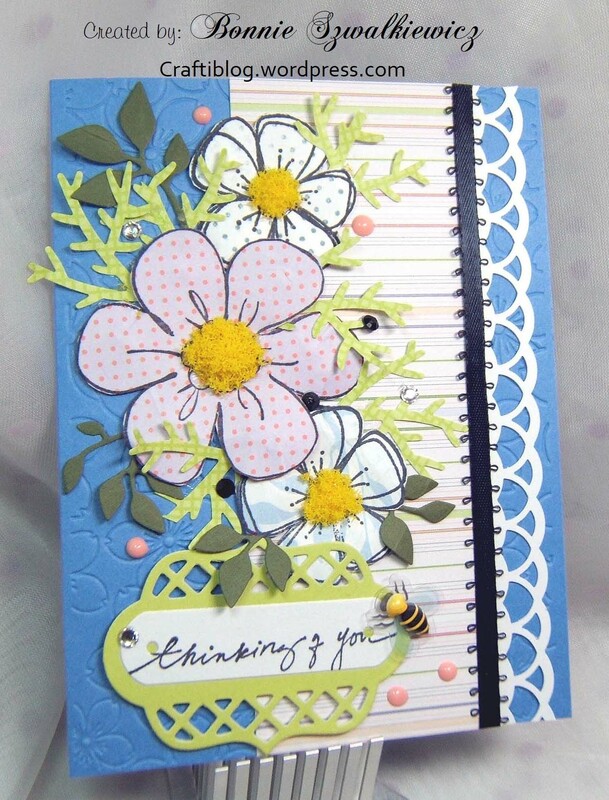 I colored it in with a gold Wink of Stella pen and added tiny yellow gems to the flowers. 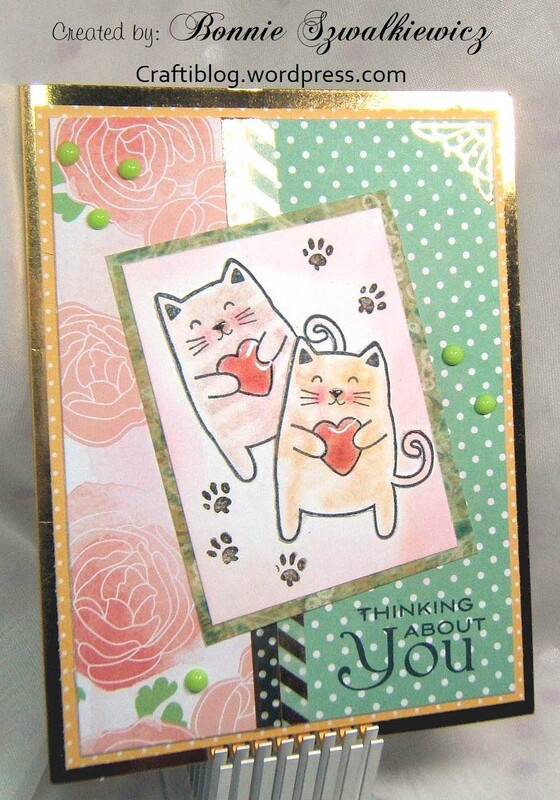 2019-04-10; April shoe box card #2; Kitties that are thinking about you. I found the kitty images in the scrap basket all cut out but not colored. I added pastels for coloring. 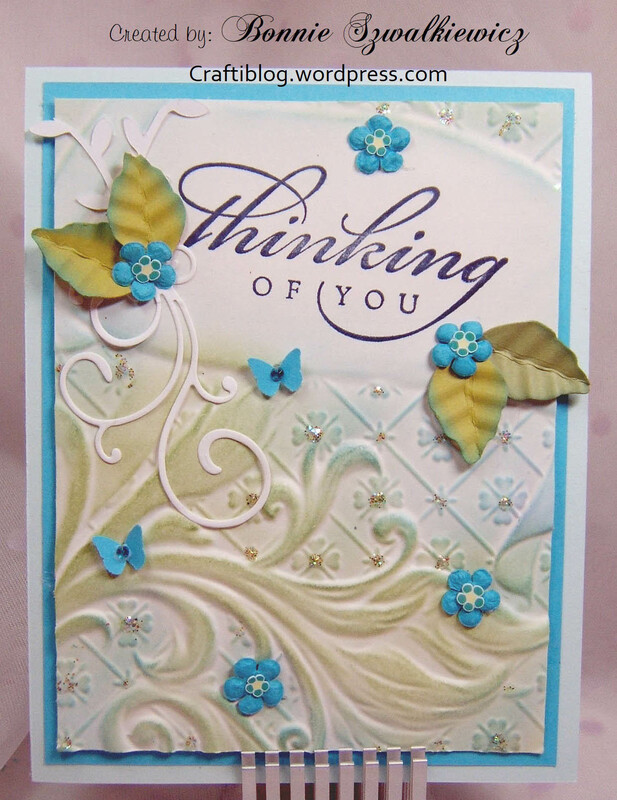 And one more look…you can see that I also added some Nuvo drops and a sentiment. I did pull out a stack of sketches to help me design. Funny how your mind goes totally blank when sitting there with limited supplies in front of you. 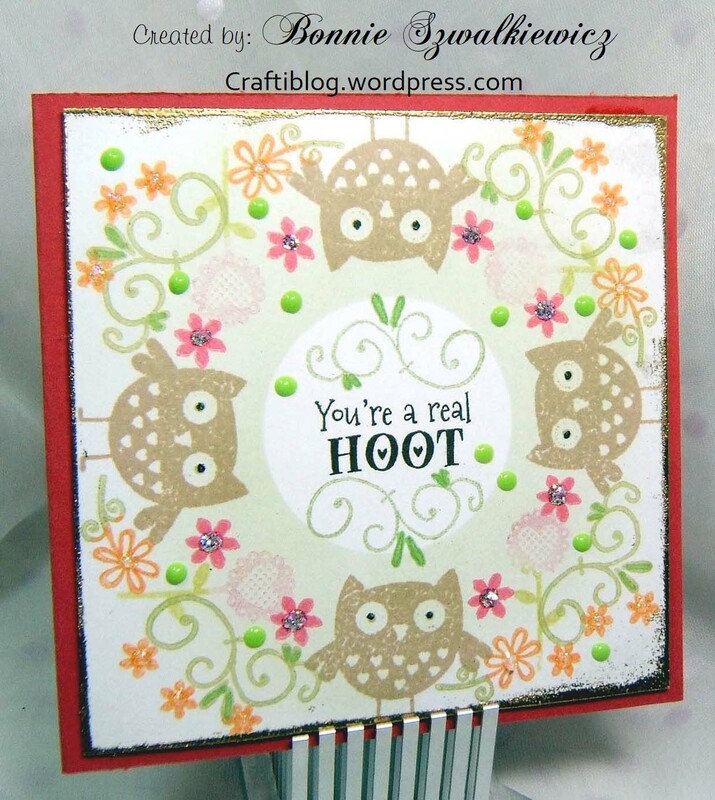 Hello crafty friends. Last evening I got together with my shoe box group. I hosted and put them all to work on this card to start the evening with. It took quite a while as they each colored the basket of quilted hearts. Here are the layers. I put 3-d mounting tape in the middle of the basket image and curled the edges downward for a “poofed” look. Lots more projects to share from the shoe box night so be sure to stop back. Once I cleaned up all of the crafting supplies from the 1-on-1 craft day with the neighbor, I found one card kit all ready to go. It just needed stamping. Out of the bunch that I made I do have a favorite. However; I wanted to try something a little different. 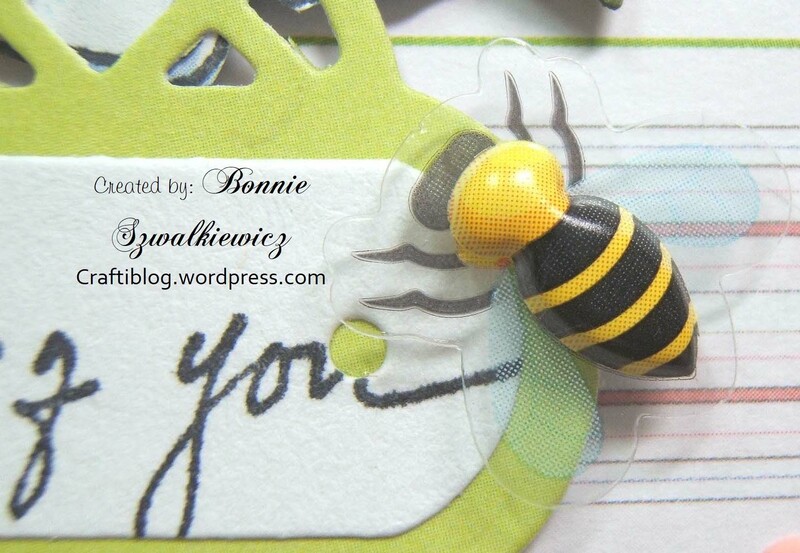 I still used only the mini $1 acrylic sets to design this sample. So it is pretty frugal. 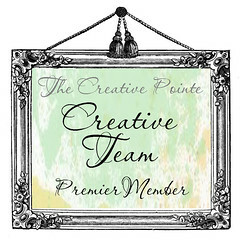 This design can certainly be accomplished without either a purchased wreath builder template or a DIY version. In fact, I only used my DIY version of the wreath builder template for the owl placement and eyeballed the rest. It just makes the stamping go faster. Here is a close look so you can see everything. I did add some sponging through a mask to get the green halo leaving the white center section for the sentiment. 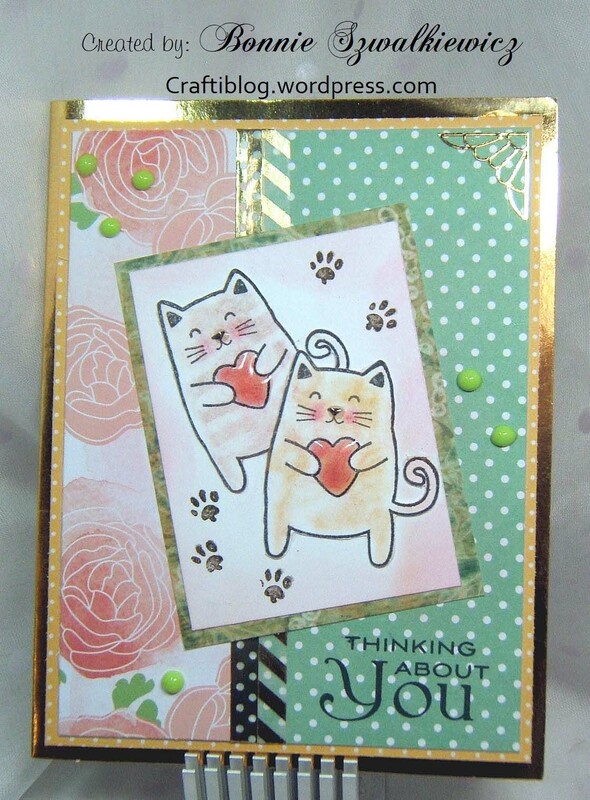 I also added glitter glue, Nuvo drops, gold embossing on the border and a black gel pen to add eyes. One more look before you go on about your day…. 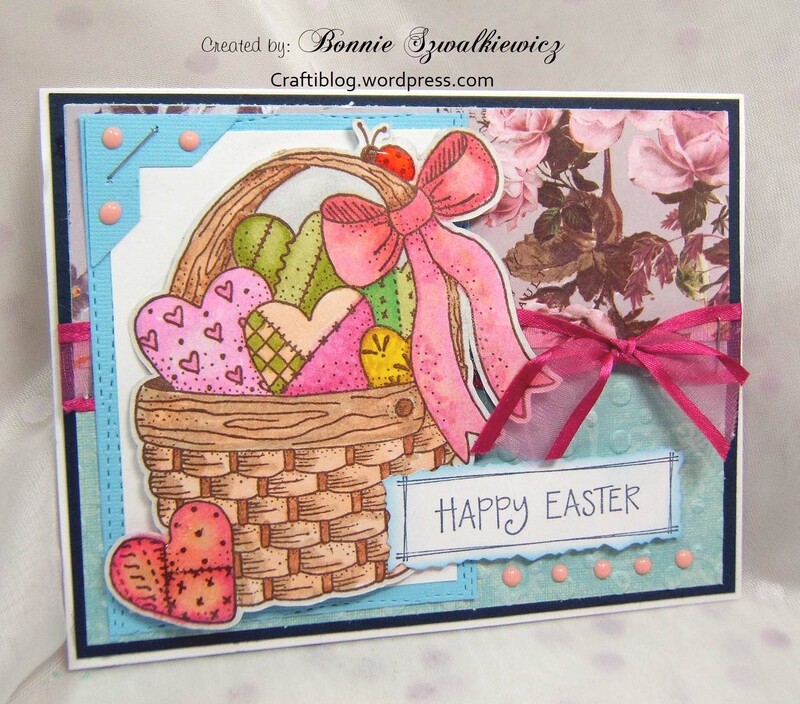 Now that the card kit has been used I think I can move on to Easter cards. 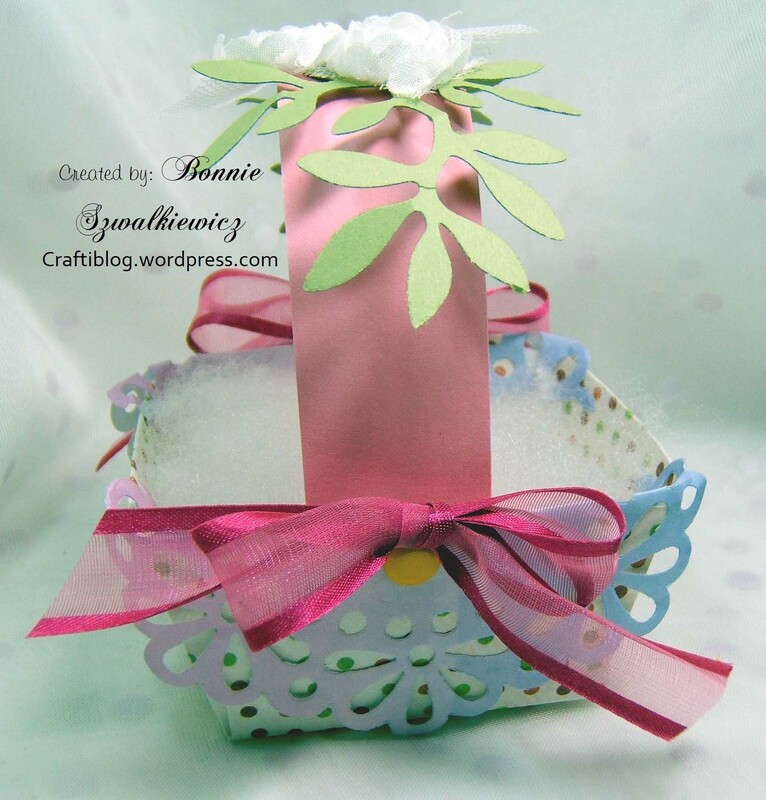 I do have to get something ready for the April Shoe Box craft night. 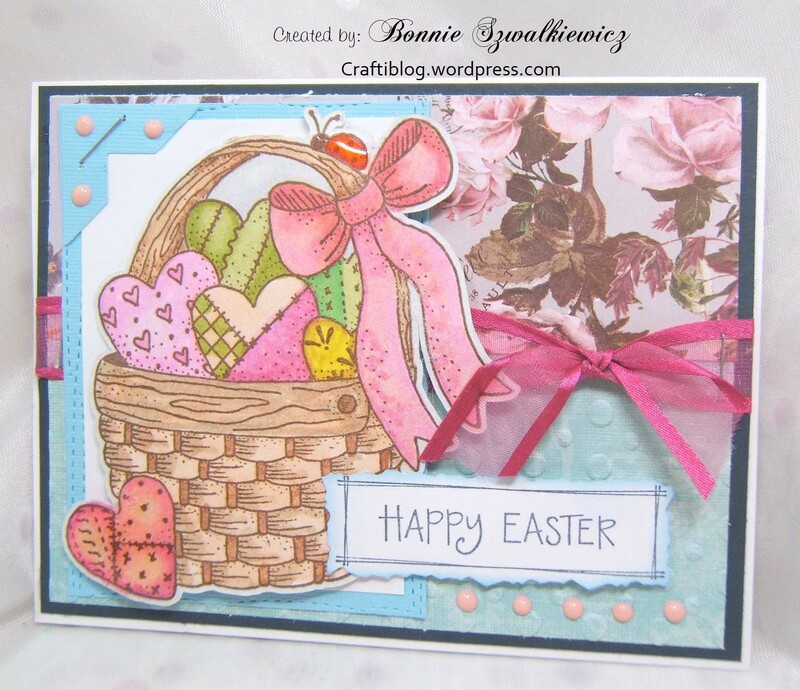 And the last card of the stamping marathon with my neighbor from last Saturday was trying out 3-d embossing folder. She had never used one before. 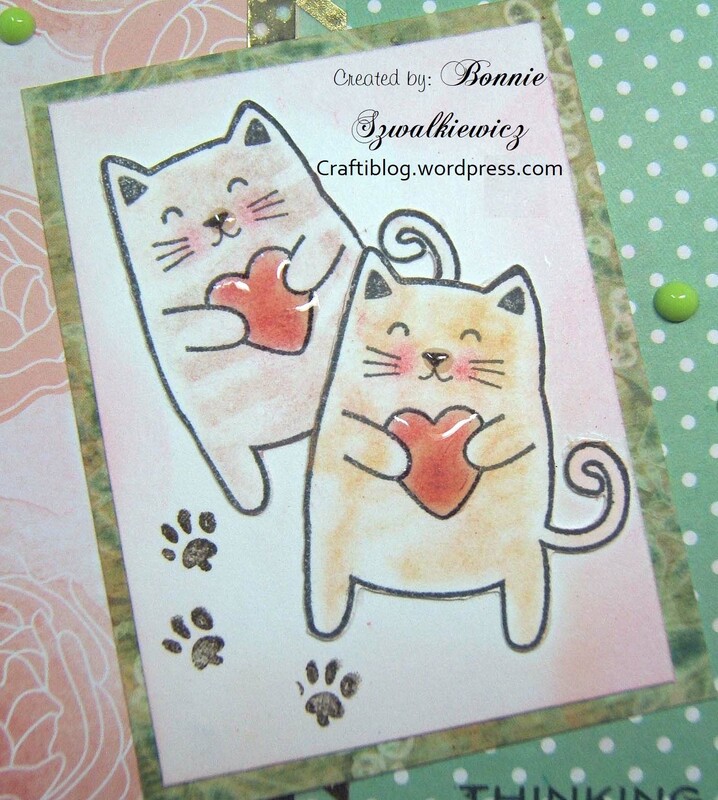 I did try this (probably 10 year old embossing folder) out a few weeks ago. You can see that sample HERE if you missed it. 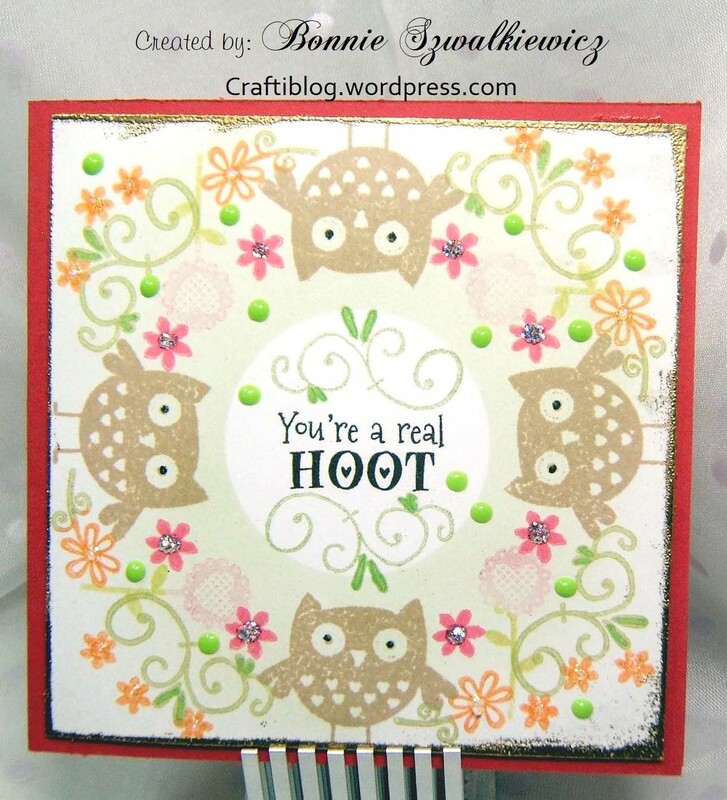 This time when we embossed, we used a bigger portion of the folder that offered a flat place to stamp a sentiment. We colored the background by sponging blue and green. 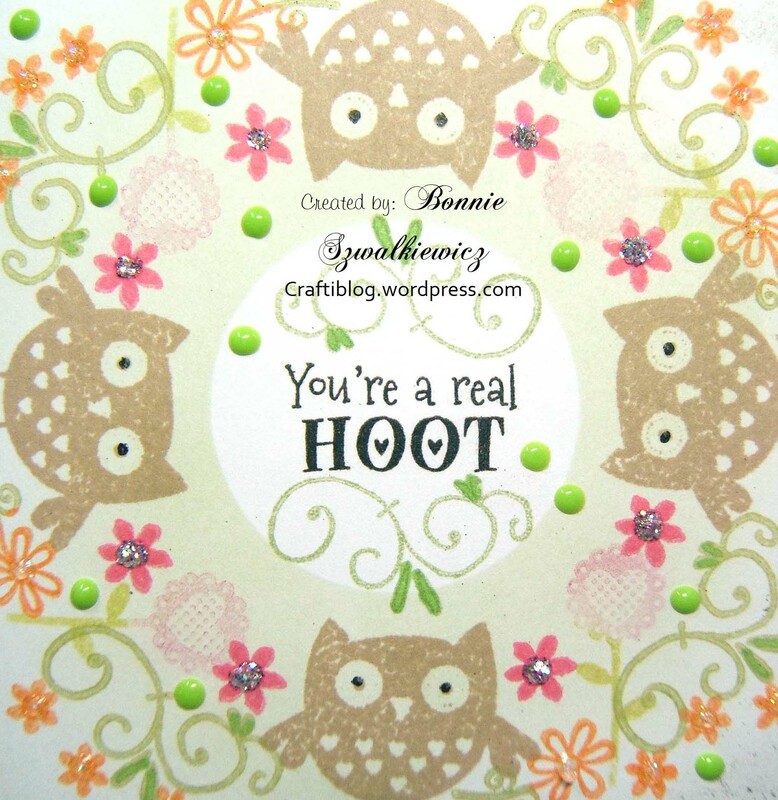 Here is a look at the sentiment (by Stampin’ Up). We decorated the panel with tiny flowers, fingernail gems, die cut leaves and glitter glue. 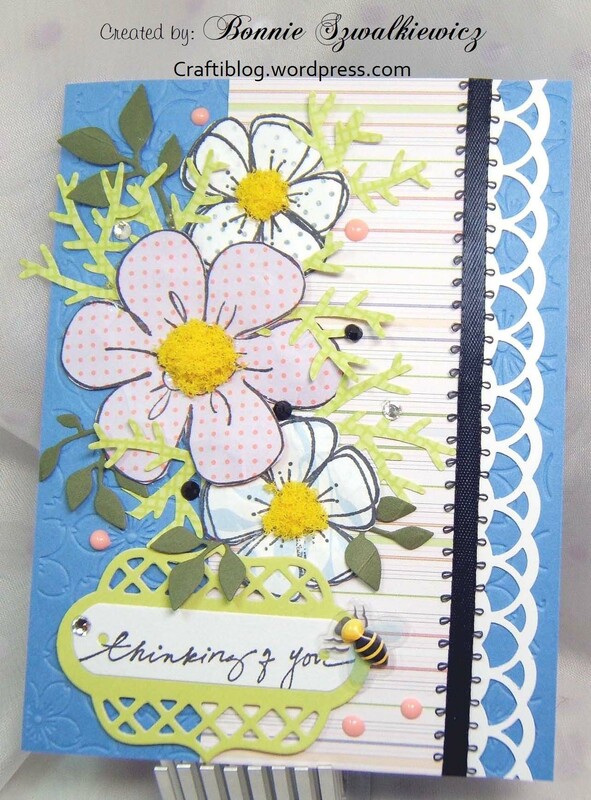 We also added some punched butterfly’s and a small flourish. 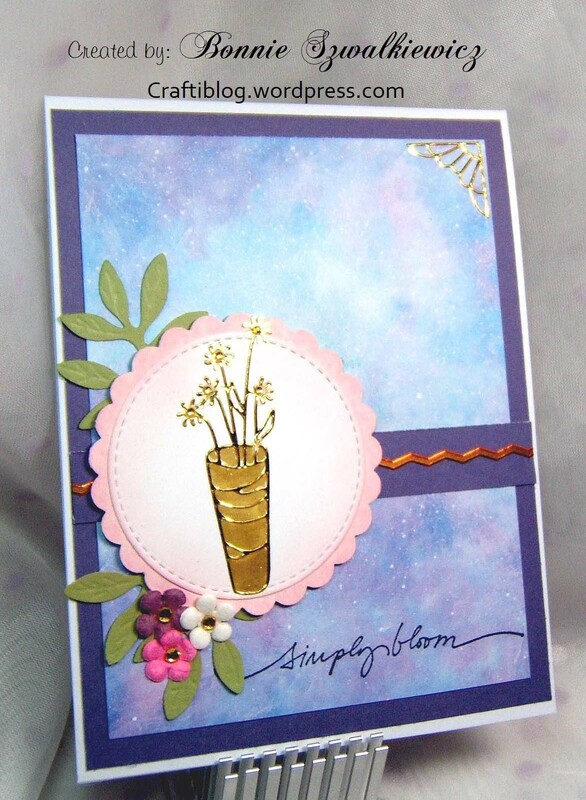 And one more look at this card before you move onto the review of all of the projects.